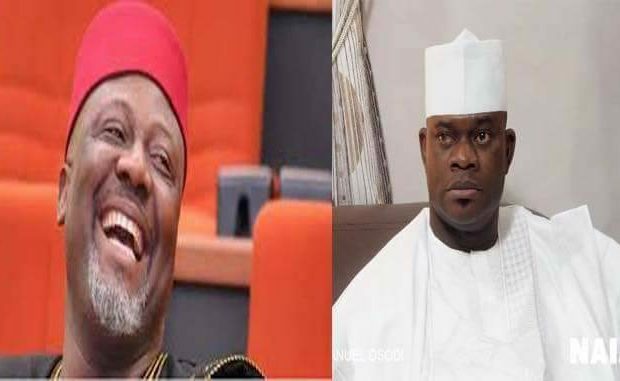 Kogi State Governor, Yahaya Bello, has blamed the lingering rift between him and Senator Dino Melaye on his refusal to waste the available scarce resources of the state. According to Bello, “We are aware of a particular senator who wants elephants to be shared in Kogi State and I refused. “The people of the state must have value for the lean resources that we are generating, and we are receiving; if that is his problem, so be it,” he said when asked to react to his disagreement with Senator Melaye.. The Governor also denied any involvement in the attack on the senator representing Kogi Central, Mr Ahmed Ogembe. Amid the political crisis in the state, the governor said the police have begun investigations into the incident while a lot of arrests have been made. DAILY POST recalls that some senators had accused the governor during plenary of introducing policies that could degenerate into a political issue if not properly handled. He, however, took a swipe at the lawmakers for failing to address national issues such as passing the 2018 Appropriation Bill presented by President Muhammadu Buhari to the National Assembly in November 2017, among several others.